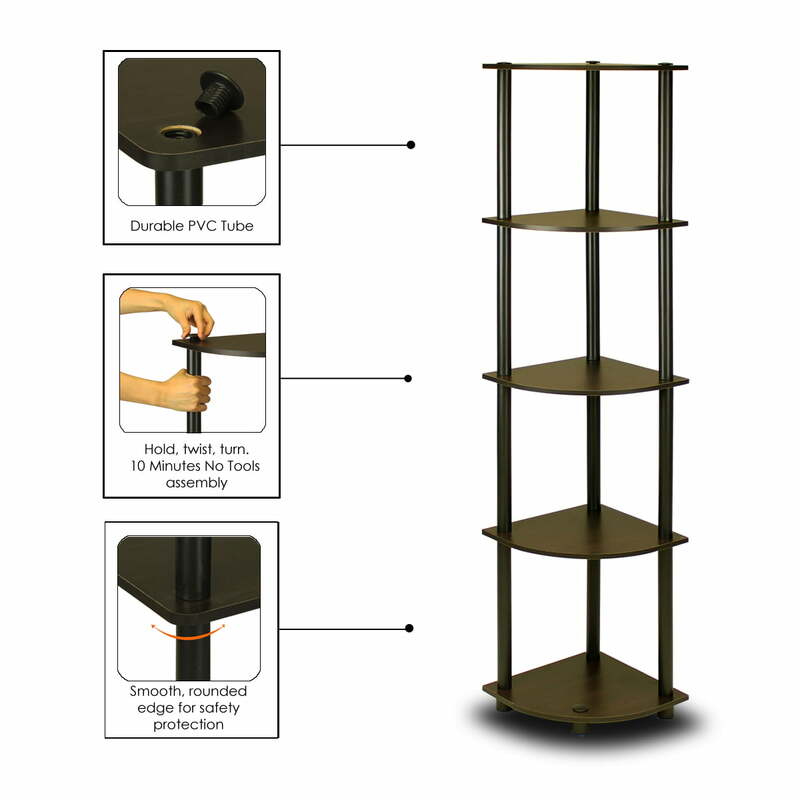 Furinno Turn-N-Tube Home Living Mini Storage and Organization Series: 5-Tiers No Tools Tube Storage Shelving Unit . (1) Unique Structure: Open display rack, shelves provide easy storage and display for decorative and home living accessories. Suitable for rooms needing vertical storage area. Designed to meet the demand of low cost but durable and efficient furniture. It is proven to be the most popular RTA furniture due to its functionality, price, and the no hassle assembly. (2) Smart Design: Easy Assembly and No tools required. A smart design that uses durable recycled PVC tubes and engineered particleboard that withstand heavy weight. Just repeat the twist, turn and stack mechanism, and the whole unit can be assembled within 10 minutes. Experience the fun of D-I-Y even with your kids . (3) The Particleboard is manufactured in Malaysia and comply with the green rules of production. There is no foul smell, durable and the material is the most stable amongst the particleboards. The PVC tube is made from recycled plastic and is tested for its durability. A simple attitude towards lifestyle is reflected directly on the design of Furinno Furniture, creating a trend of simply nature. All the products are produced and assembled 100-percent in Malaysia with 95% - 100% recycled materials. Care instructions: wipe clean with clean damped cloth. Avoid using harsh chemicals. Pictures are for illustration purpose. All decor items are not included in this offer.